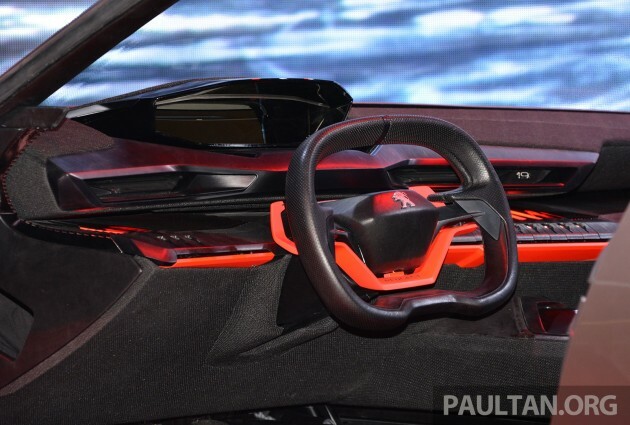 Paris 2014: Peugeot Quartz Concept, a 3008 preview? 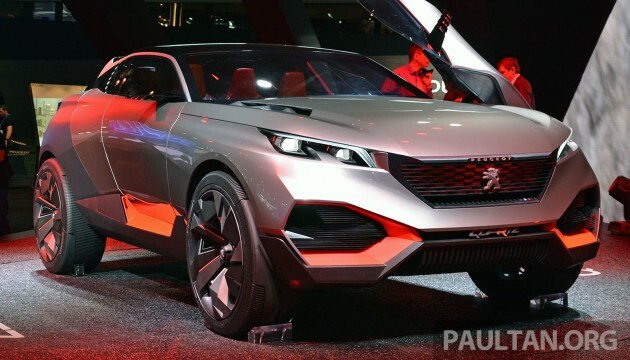 Home » Special Coverage » 2014 Paris Motor Show » Paris 2014: Peugeot Quartz Concept, a 3008 preview? Peugeot’s cave of a stand at the 2014 Paris Motor Show had this on the main stage – the Peugeot Quartz Concept. Billed as a “new vision for the crossover segment” and a “next generation SUV” the Quartz sits on the same EMP2 platform that underpins the new 308, so this could be an early preview of the next-gen 3008. Peugeot says that the Quartz combines the body of an SUV with the cabin of a saloon, whatever the latter means. Its imposing 4.5 metre long and 2.06 metre wide frame sits on massive 23-inch wheels. Fronting the long bonnet is a grille with a chequered pattern that shifts depending on the angle you view it from. A glass roof flows towards the rear wings and incorporates two spoilers to further enhance aerodynamics. These are aligned with the Coupe Franche separator between the two Quartz finishes: mineral grey at the front, inspired by rock crystal, and matte black for the rear wings, offset by splashes of red. Inside, basalt can be found on the centre console, alongside digitally woven textile. Peugeot says that this innovative process can create large and complex components that can be used as soon as they come off the machine – no cutting required. The textile is woven with polyester fibre from recycled plastic water bottles. The concept uses a plug-in hybrid drivetrain comprising a 270 hp/330 Nm 1.6 THP engine supplemented by two 85 kW electric motors (front and rear axle) and mated to a six-speed automatic gearbox. There are three driving modes: ZEV (zero emissions electric vehicle), Road (ICE and front electric motor) and Race, which combines the engine and both electric motors to get the most out of the chassis along with a limited-slip differential. Wow.. If this is the next thing to come.. I m in love.. This is what we all good design. I will buy one for my wife. Just make sure there is enough rear leg room, make sure it is not cramp.